Information technology facilitates the flow of knowledge in modern society. Access to information and using that information to grow knowledge that benefits one's community is﻿ possibly the greatest benefit of the Internet and other technologies. 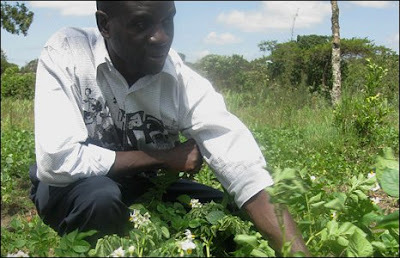 Zack Matere, a farmer in Soy, Kenya, searched for a way to save his dying crops. What he discovered was a desire to help local farmers and businesses access information. "It is not right that as knowledge gets more and more to be online that good, hardworking, intelligent people in rural parts of Africa and the developing world are left behind as while solutions to their problems are available in the ‘air’." "Leo pamoja’, which means ‘Together Today’ in Swahili, is my attempt to enable rural communities in the developing world access information from the internet and other sources right there at the village Market Square. A simple wooden or Metal Information Board is put up at the Square and posted on with printed out information and Pictures that are updated on a daily basis. Men, women, the youth and children are able to communicate to other villages through an S.M.S Blackboard. My pilot project in Likuyani District Western Kenya, I intend to put up twenty-six noticeboards in twenty villages and six primary schools and be able to reach seventy thousand people with regular digital content."